Jordi Embodas (Barcelona, 1977) is a Barcelona-based graphic and type designer. His main activity is still working in graphic design, at Juste Calduch Studio since 2001. He also teaches typography at Elisava School, where he has done so since 2010. Over recent years, Jordi’s work has been recognized in the typography field in Spain. From his hometown of Barcelona, Jordi Embodas founded Tipografies (typefaces in catalan) in 2010, basically to show and promote his typefaces. 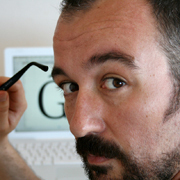 He began designing fonts as a hobby in 2008, and specialized in text fonts considered more complete, useful and durable.